120 DEG VEE SETS Contact surfaces have threaded holes for mounting serrated grippers, if needed. Serrated Grippers Hardened tool steel grippers can be mounted on the contact surfaces of the 120 Degree Vee Sets. Half Vees may be positioned relative to a bushing location by setting the distance with gauge blocks. The other Half Vee is then positioned with gauge blocks relative to the first Half Vee. Calipers may be used to position Vee Sets relative to a bushing location. Alternatively, calipers may be used to document the location of Vee Sets which were previously positioned. 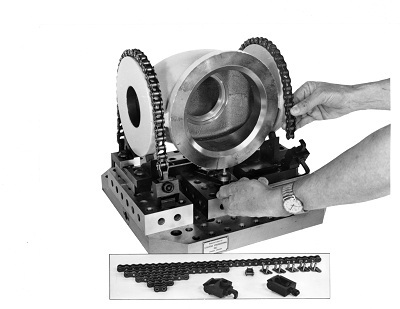 The workpiece below is located for secondary operations using Stevens Vee Sets on previously machined flanges.